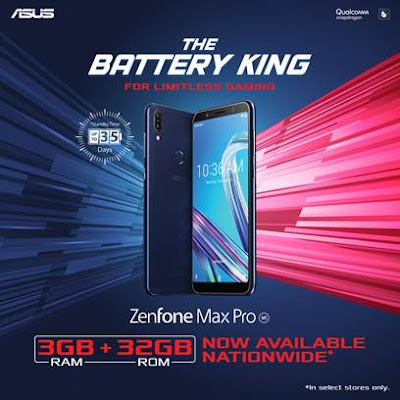 BoyRaket.com: ZENFONE MAX PRO 3GB IS COMING TO STORES NEAR YOU! ZENFONE MAX PRO 3GB IS COMING TO STORES NEAR YOU! Anyone can enjoy limitless gaming as the ZenFone Max Pro 3GB/32GB becomes officially available in select ASUS accredited stores and ZenFone kiosks nationwide. Gamers on a budget will find it definitely easier to experience gaming like no other on the ZenFone Max Pro, with its 5,000 mAh battery capacity, 3GB storage, 32GB memory and Qualcomm™ Snapdragon™ 636 processor, without breaking their banks. The latter variant of the ZenFone Max Pro with the 4GB storage and 64GB memory and 16MP + 5MP dual rear cameras continues to be available in-stores as well.